Each student should have a piece of paper and a pencil. (Rulers optional) Their desks should be positioned facing the teacher as information is presented. Papers should be placed in the horizontal “landscape" position. Students will add to the paper as the teacher provides information from the book or other source. On the top line write Constitution. The Constitution contains rules for how the government must work. 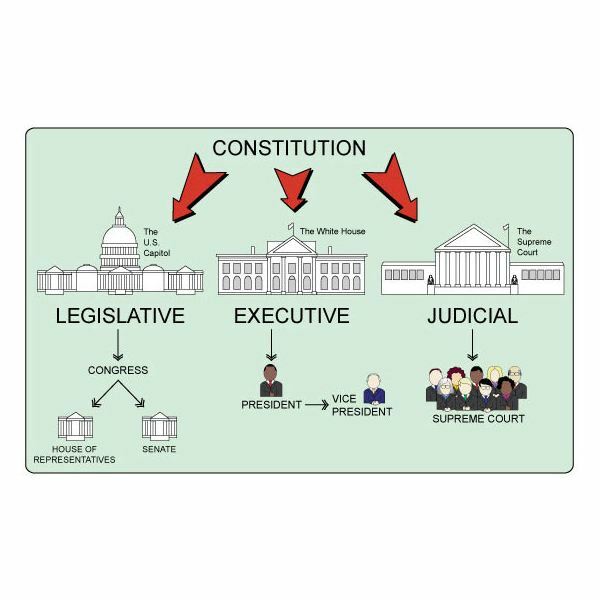 It created three separate parts or branches of the government each with different duties. On the left horizontal line write Legislative. Under the line write key words such as: Congress (federal and state), Senators, Representatives, makes laws, imposes taxes. Federal: creates military, can declare war. On the middle line write Executive. The key words could be: President, vice president, Governor (state), Cabinet, carries out laws. On the last line write Judicial. Key words could be Supreme Court (federal and state), judges, justices, settles disputes, interprets laws. Allow ten minutes to review the students’ papers from the prior lesson. Then play a review game called Human Tic-Tac-Toe based on the game Tic-Tac-Toe. Provide two colors of construction paper, one color for each team and six pieces per team. Divide students into two teams. One team on each side of the playing area. You may choose to have them sit on the floor, chairs or at their desks. Have an open space in the center between the two teams where students will imagine that there is a tic-tac-toe board. Ask a question to the first player of one team (based on the information learned in the prior lesson.) If correct that person takes one of their team’s colored papers and sits in a position on the tic-tac-toe board. Continue with another question to the opposing team. A team wins when they have three of their colored papers in a row across, up and down or diagonally. Tic-tac-toe!! Have students complete this worksheet. Sobel, Syl. The U.S. Constitution and You. Barron’s Educational Series, Inc., 2012.